Presented by Her Imperial Majesty Elizabeth, Empress of Austria, in 1880. Of cloth or gold with orphreys of green silk embroidery and edging of green silk with small gold shamrocks. 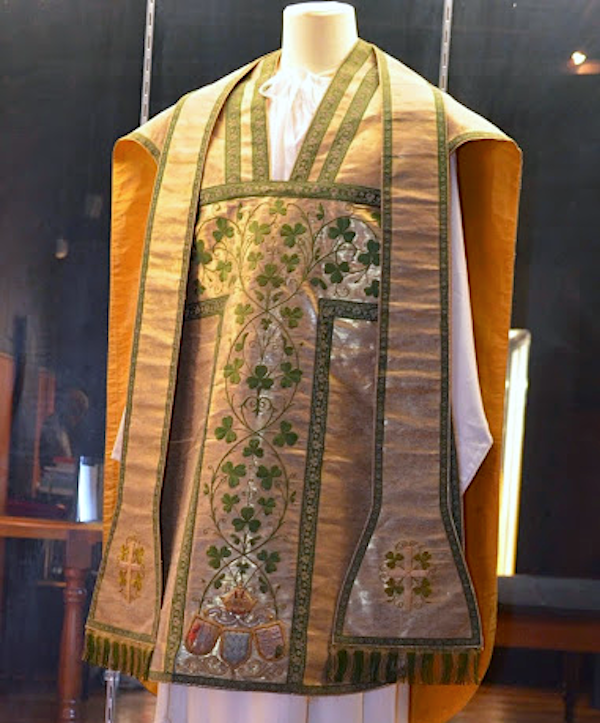 The cross on the chasuble is ornamented with hand-embroidered green silk shamrocks. At the base three shields are embossed bearing the arms of Austria, Bavaria and Hungary. They are surmounted by the Austrian crown. The name Elizabeth with the date 1880 is worked on to the lining near the lower edge of the back. The interspaces are plain. Violet crosses with a shamrock above and below each arm are embroidered on the stole and maniple which have a green-gold fringe. 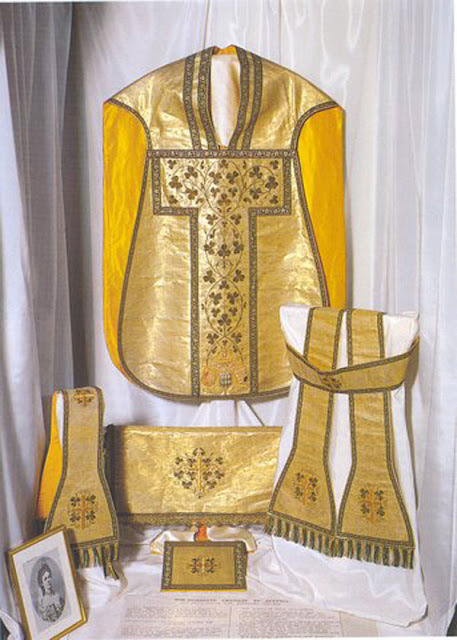 The maniple has two green-gold tassles. The veil has green-gold edging and a violet cross amid shamrocks. All lined with yellow-gold silk. Here is a photo showing the front of the chasuble with its shamrocks and arms. The use of the shamrock in this design is particularly effective and surprisingly uncommon. It is very tastefully done and that, combined with the Austro-Hungarian heraldry, completes the story of these vestments very effectively.